Can I record a DVD in Progressive Scan? Is It Possible To Record a DVD in Progressive Scan? Progressive scan provides the basis from which most video processing is built on. It is used in digital TV broadcasting (that is what the "p" means in 480p and 720p), and all LCD, Plasma, and OLED TVs can display images in the progressive scan format. Progressive scan can be applied to standard definition (480p), high definition (720p, 1080p) and 4K Ultra HD (2160p) images. However, although 480p and 720p video signals can be transmitted by TV stations, and Blu-ray Disc and internet streaming services can transfer video signals in 480p, 720p, or 1080p, commercial DVDs and DVDs you can make using a DVD recorder are not recorded in high definition or progressive scan. On DVD players and recorders, progressive scan is not available during recording but is a process that can be applied during playback. It also requires an output connection that is compatible with a progressive scan signal. These outputs can be either progressive scan-enabled component video or HDMI outputs. In rare cases, you might find a DVD recorder with component video inputs, but these inputs are not progressive scan nor high definition compatible. When using a DVD recorder, all DVDs are made in the 480i resolution format, regardless of the input connection used. 480i is a resolution format that consists of an image that 720 pixels wide and 480 pixels tall. The "i" designation stands for interlaced, which means that half of the image is transmitted or transferred at a time using alternate lines or pixel rows. The reason that DVDs are all recorded in the 480i standard is that is how the DVD can be read by all DVD players (such as older non-progressive scan units) and be shown on both digital and analog TVs. You have to remember that when DVD was introduced in 1996, there were still a lot of analog TVs in use so DVD standards took that into consideration. To put this whole process in basic terms, pre-recorded DVDs you purchase, or the ones that you make are recorded in 480i. However, when you play your DVD back to watch on a television or computer monitor, it is how the processors in the DVD player or another type of upscaling processor placed between the DVD player and the TV, or the processing capabilities of the TV that determines how the image is displayed on your screen. All a DVD recorder can do is receive the antenna/cable, VHS, Laserdisc, or camcorder source signal as it comes in. This video signal is then automatically recorded in 480i onto a DVD. Once recorded, the DVD can then be played on another DVD player (depending on the disc format used — such as DVD-R,etc..). If you wish to view the DVD playback in an upscale fashion, you either the DVD player must be equipped with progressive scan or video upscaling, or connected to a home theater or external video scaler, and/or TV that has this capability. When playing a commercial or home-recorded DVD on a DVD player or recorder, it will read the 480i resolution format signal that is placed on the disc. How that signal is passed out to a TV or video projector is determined by any added video processing that may be incorporated into the DVD player, recorder, TV, or video projector. Unprocessed, the signal is simply sent in the native 480i resolution format, but, if added video processing is employed it can be sent differently. If 480i is converted to 480p during playback by a DVD player or recorder that has this capability, the resolution is still the same (standard definition) but since the entire image is sent at one time to a compatible TV or video projector, the image is less susceptible to interlacing artifacts, such as jagged edges. Progressive scan is better suited to fast-moving images, such as sports play. Although progressive scan conversion can be done through either the DVD playback path or a progressive scan-capable TV, it is more efficient to have the DVD recorder or player do it. However, in this scenario, both the DVD player and the TV or projector needs to be compatible with progressive scan in order to display it. In terms of video quality, DVD recorders are definitely a step above the old VCR, but there are limitations, one of which is the inability to record video onto DVD in a progressive scan format. Even if it were possible to record a DVD in a progressive scan format, the DVD you make would not be playable on a non-progressive scan DVD player or viewed on an analog TV. A DVD player (or recorder - in playback mode) equipped with progressive scan converts the 480i to 480p for display on a progressive scan, HD, or 4K Ultra HD TV. For HD and 4K Ultra HD TVs, an upscaling DVD player can convert a 480i DVD to 480p, 720p, or 1080p. 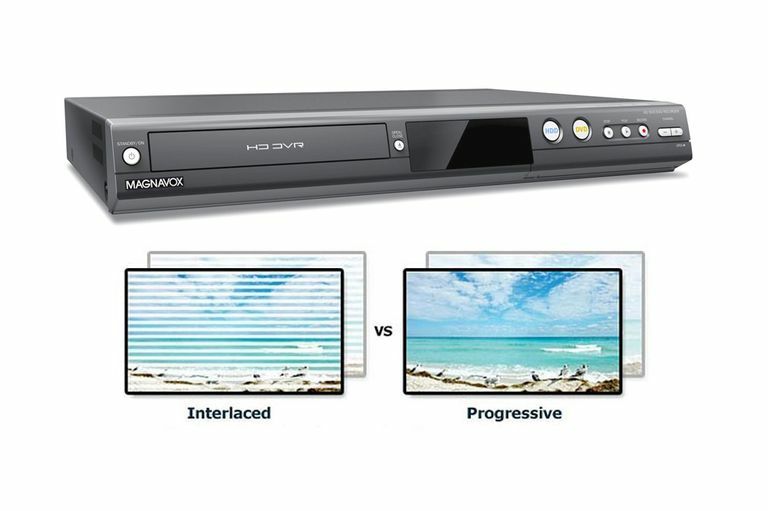 When you see a DVD recorder advertised as having progressive scan capability, what they are referring to is that the DVD recorder can play back DVDs in a progressive scan format, but not that it will record in progressive scan.